Xeno Canto: Bird Songs from Tropical America. Xeno Canto continues to grow and as of November 2007 provides online access to about 15,000 vocalizations of more than 3,000 species of Neotropical birds, including Recurve-billed Bushbird, three Neomorphus, Araripe Manakin, all the potoos, White-winged Guan, Yellow-eared Parrot, Great Antpitta, Alagoas Tyrannulet, and many other rare birds. 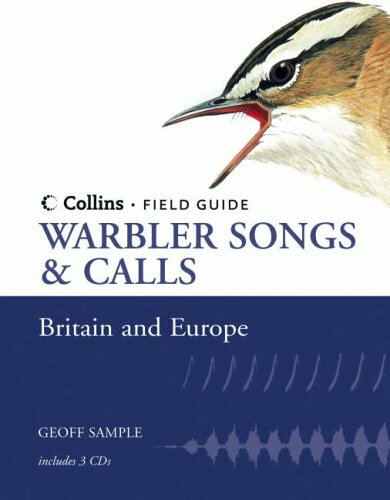 New: The Bird Songs of Europe, North Africa and the Middle East by Andreas Schulze & Karl-Heinz Dingler. 819 species; running time 19:20 hours; 2817 recordings on 2 MP3-DVDs, with pdf booklets in English, French and German. Available from Amazon.de. NEW: Bird Voices of Alta Floresta and Southeastern Amazonian Brazil by Curtis Marantz & Kevin Zimmer. Macauley Library of Natural Sounds 2006. 6-CD set. ISBN: 0938027670. Available from Sapsuckerwoods.com. Victorious birds sing triumph over losers. New Scientist, 10 February 2004. Tropical Boubous in Côte d'Ivoire that successfully defended their territory from a simulated confrontation sang a distinctive "victory duet" from a high perch 30 minutes after playback stopped. If you're interesting in upgrading microphones, B&H Photo now offers a package deal on the Sennheiser MKH 70 long shotgun RF condenser mic, with a kit including the mic, pistol grip shockmount, blimp windscreen, and long hair wind muff for $1699.95. You'll also need a power supply, mic to power supply cable, and power supply to tape deck pigtail cable (for a stereo deck with dual XLR inputs, ie, Sony TCD5ProII). Shortwing.co.uk - Asian bird sounds and photos. Mandarin Productions - Publishers of Clive Barlow's new 3 CD set, Bird Songs of the Gambia and Senegal. Listen to calls of Spix's Macaw. (Now extinct in the wild.) To hear a simulated "flock", open this sound file (same tape, different file) while the first is running. From the Projeto Ararinha Azul website. Following are some direct links to audio files on other birding websites. You should be able to listen to them in one or more of the following free programs: Winamp, Musicmatch, Windows Media Player, RealPlayer, and Quicktime. I am using CoolEdit2000 to digitize my tapes and create sonograms. Bahia Spintail, Synallaxis whitneyi, with Rio de Janeiro Antbird, Cercomacra brasiliana, in background. Boa Nova, Bahia, Brazil, July 1998. Tall-grass Wetland Tapaculo, Scytalopus iraiensis. Type locality at Quatro Barras, Paraná, Brazil. Teus Luijendijk - Including Grey-crowned Crocias, Short-tailed Scimitar-babbler, Coral-billed Ground-Cuckoo, and a mystery warbler from Vietnam. Huayco Tinamou Rhynchotus maculicollis (Song). Also heard are a song of Rufous-collared Sparrow Zonotrichia capensis and a song of Gray-bellied Flowerpiercer Diglossa carbonaria. This species was formerly considered a subspecies of Red-winged Tinamou Rhynchotus rufescens, but I [SM] discovered it has a very different song (see The Auk, Vol. 113 No. 3 July 1996, p. 695-697). This bird is often heard in the mountains of Bolivia, wherever there are grassy areas on mountain ridges, at altitudes from about 750 m. up to 3500 m. It is not found on the Altiplano, nor in the western mountains. Great Antshrike Taraba major (Song). Also heard are the song of White-tipped Dove Leptotila verreauxi and various vocalizations of Fawn-breasted Wren. "Masked" Antpitta Hylopezus auricularis (Song). Formerly considered a subspecies of Spotted Antpitta H. macularius. Rediscovered by me [SM] in April 1994 just outside the town of Riberalta, department Beni. It was first found in 1937 by Alfonso M. Olalla, only a few kilometers from Riberalta, on the opposite bank of the Rio Beni. In 1945 Nils Gyldenstolpe described it as a subspecies of Spotted Antpitta. I discovered that it merits species status because of its distinctive song and habitat. I propose the English name "Masked Antpitta". "Masked" Antpitta Hylopezus auricularis (Call). The calls of this species are very distinctive. They are often heard at dusk when it is almost completely dark, but also serve as alarm calls. Giant Cowbird Scaphidura oryzivora (Song). Also heard are a song of Plumbeous Pigeon Columba plumbea (the yungas race with a very different song, quite probably a distinct species) and a song of Dusky-green Oropendola Psarocolius atrovirens. Errata to Peter Boesman's CD-ROM "Birds of Venezuela - Photographs, Sounds, Distribution", third in the series of bird song CDs from Bird Songs International B.V.
John van der Woude's trip reports, some of which include bird recordings. OwlCam Sound Library - Excellent compilation of calls of Barred Owls. Sounds of the Seychelles. They offer 2 CDs of nature sounds. Some mp3 excerpts are on the website, including Seychelles Blue Pigeon, Seychelles Paradise-Flycatcher, Seychelles Bulbul, Seychelles White-eye, and Seychelles Magpie-Robin. Animal Sounds on the Web - Birds 1, Birds 2, and Birds 3, a compilation of online sounds. Aves de Chile - Sonidos - a frustrating website, since only local Spanish names are given, i.e., equivalent to "the Robin" or "the Jay". Shaun Peters' index to published bird sound recordings - Continues to grow -- more than 7,500 species! British Library Natural Sound Archive [Searchable catalogue of bird recordings] - Source for the Chappuis recordings of West and North African birds. of Caracas, Venezuela has a very comprehensive Library of Tapes of Venezuela containing vocalizations of more than 700 species, which he generously makes available for scientific use. Lang Elliott, Stokes Field Guide to Bird Songs: Eastern Region of North America. The best compilation of recordings for Eastern North America. Kevin J. Colver, Stokes Field Guide to Bird Songs: Western Region of North America. The first choice for the western U.S., with many subspecies that may someday be split.